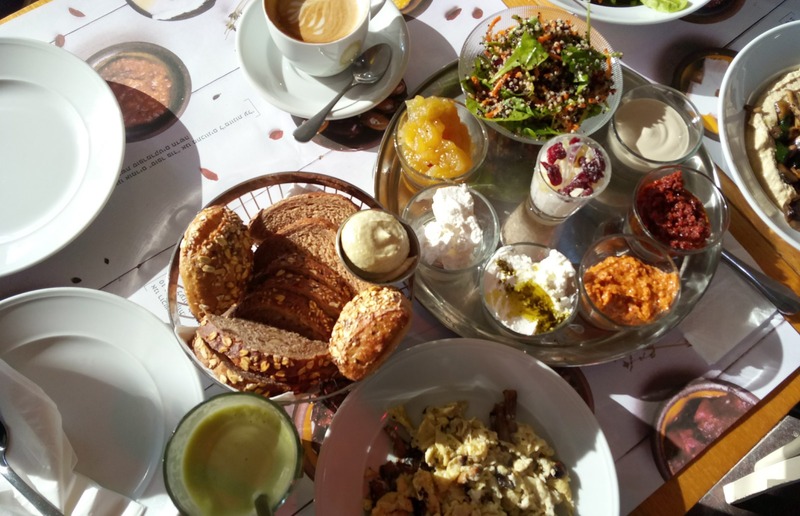 Many things might be new and uncertain to you while visiting Israel, but one thing is definite: You are going to enjoy some of the best breakfasts of your life here, and that’s because Israeli breakfast is more than just a meal; it’s a lifestyle that connects Israelis to their past, present, and future. Affordable to most, and oh so very shareable, the buffet or mezze style eating that was ushered in by Israel’s early kibbutz-living pioneers now belongs just as much to the café-going hipsters of Tel Aviv, as well as to those who long to escape the city for a more pastoral view and romantic artisanal experience. We can’t explain it, but salad, cheese, and olives for breakfast just works here! Go with it, and not only will you feel satisfied and full, but odds are you’ll also feel light, energized and possibly inspired to up your everyday breakfast game plan. 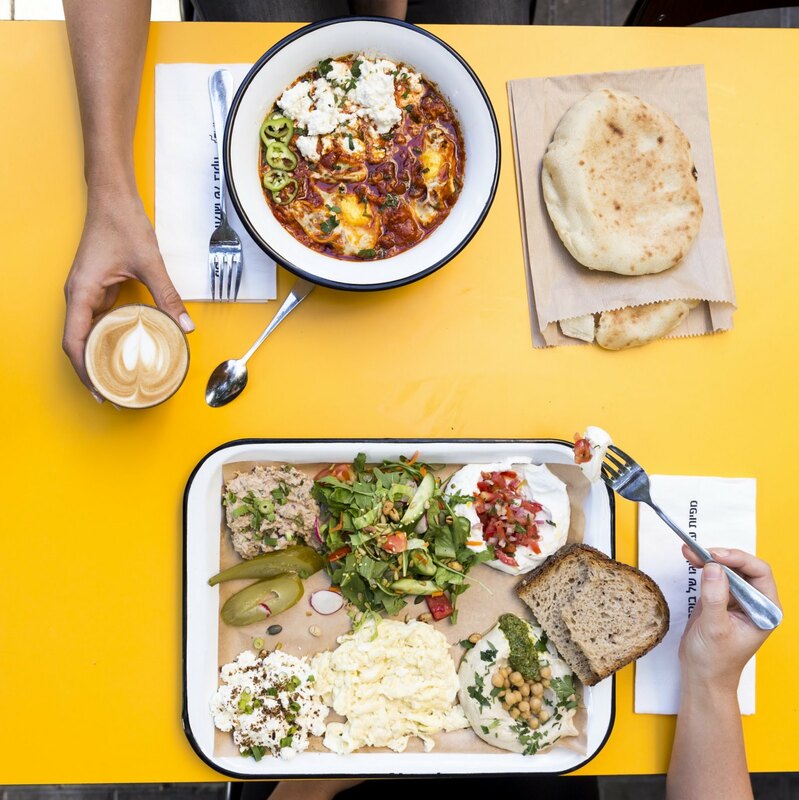 We couldn’t just choose a few, so here are 14 top places to get a particularly impressive and overall yummy Israeli breakfast. Possibly the most relaxing, or at least most inspirational, place for a leisurely breakfast, Derech HaGefen in the foothills outside Jerusalem is one of the few Israeli restaurants that truly practices farm-to-table eating by growing vegetables and herbs on the premises in beautifully maintained gardens and the restaurant’s nursery. The atmosphere, complete with little footbridges over idyllic brooks, and in-bloom plants and greenery, make this getaway an ideal place for an omelet stuffed with plenty of fresh vegetables, the freshest of salads, house-baked bread served with high-quality butter and jam, alongside a platter of cheeses and homemade spreads for slathering. 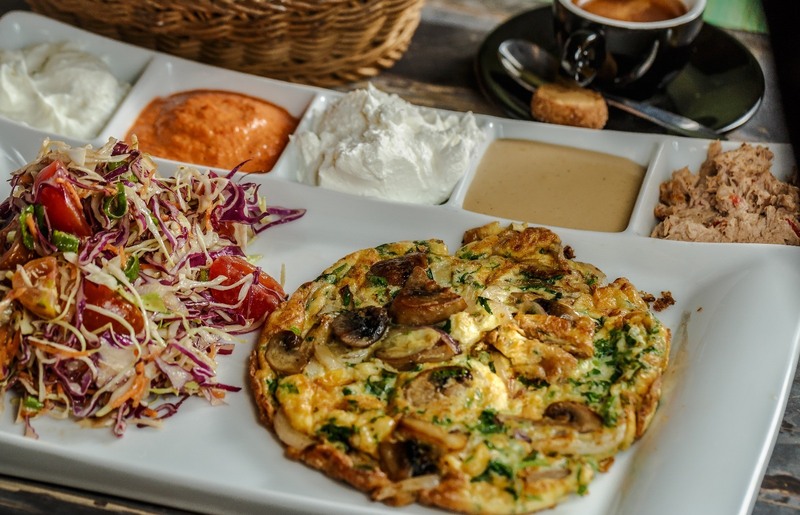 At pastoral Kfar HaRoeh, just outside of coastal Hadera, you can indulge in six elaborate breakfasts suitable for everyone from vegans (soy cheese and black tahini, among other treats) to those who wish to “corrupt” their day with sunnyside-up eggs on focaccia. There’s brioche, butter and homemade jam; or the traditional Israeli breakfast, which comes with spreads aplenty. Sit outside in a beautiful tree-lined courtyard, or front and center inside the bakery/café, where you can drool over the beautifully decorated cakes, artisan breads, pies and other French- and Israeli inspired treats on display. This boutique café chain in Tel Aviv Port, as well as other foodie markets including Sarona Market in Tel Aviv and Agmon Market in the northern Hula Valley, was created as a reminder of the “good life” lifestyle embodied by owner Ehud Segev’s brother, who fell fighting in the second Lebanon war. 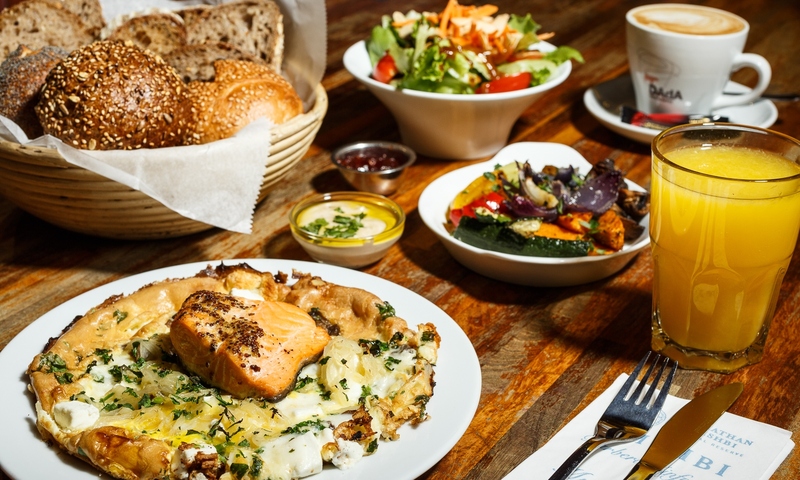 Also created as a way to bring the peaceful feeling of the pastoral North, where the brothers grew up, and to hectic Tel Aviv, Café Nimrod is a great place for a truly authentic and elaborate Israeli breakfast. Bursting with freshness in the form of fresh veggies, bulgur wheat and cranberry salad, spreads, cheeses and veggie antipasti dusted with black and white sesame seeds, as well as an overflowing slate plate piled high with chopped salad, served next to cracked Suri olives from the North, this is a healthy breakfast that will also qualify as your weekend treat (we’re talking about the platter of sweet and savory breakfast pastries that comes with their upgraded version). At Elchanan Bread Culture in Kibbutz Mishmarot, near Pardes Hanna-Karkur in the Sharon Plain region, it’s all about the bread, as you can probably imagine. Owner, chef and head baker Eldad Shmueli creates dishes that highlight the beauty of the natural flavors of his sourdough artisan breads. 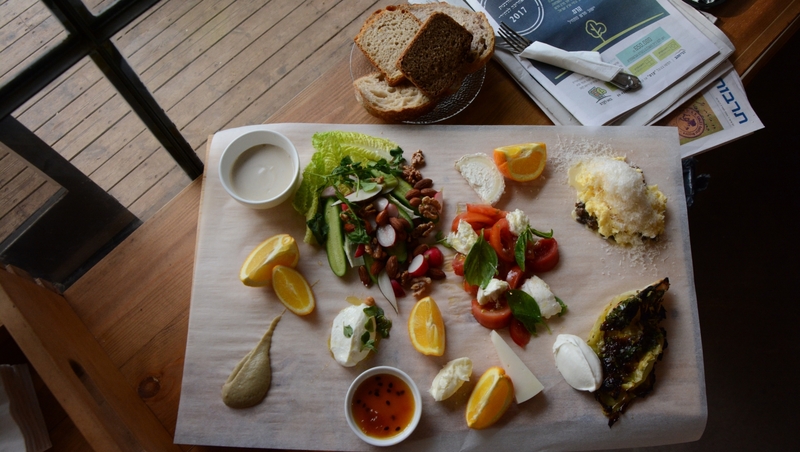 Here, Israeli breakfast feels like a chef meal or an artful cheese plate, displayed on one stretched-out piece of brown paper, and paying homage to the seasonal ingredients. Shining examples could be a perfectly charred wedge of cauliflower, or a juicy bunch of fresh picked grapes. All you can do is enjoy the simplicity, while you use the glorious bread to sop up the salads and other farm inspired bites, which include Israeli-made cheeses, fresh salads in inventive and classic combinations, and whatever else Shmueli feels captures the sense of the land on which his restaurant stands. And we didn’t even mention the breakfast pastries and other baked goods, which you dare not miss out on, even if you have to order them to go. Involving in-house wood-smoked salmon, perfectly poached eggs, and a selection of Valhrona-infused chocolate desserts, breakfast at Tishbi Winery restaurant in Zichron Ya’akov is an other-worldly experience. 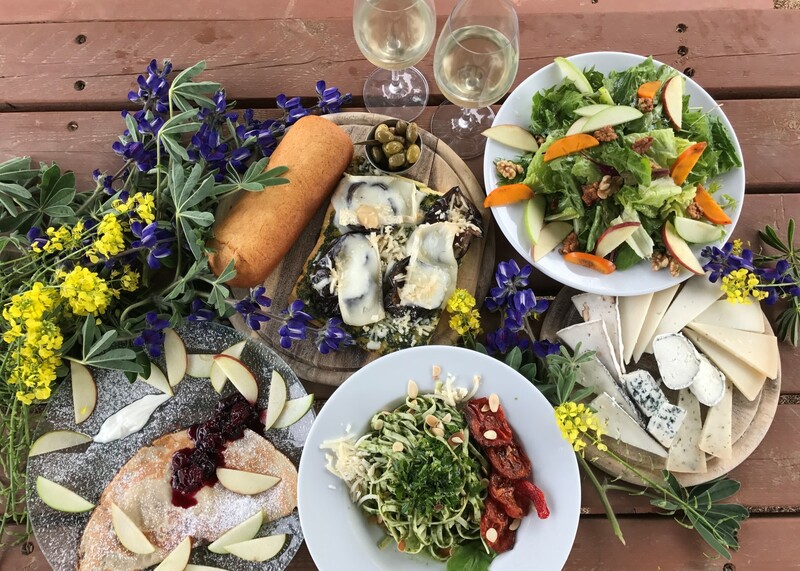 While you dine on these and other treats, such as salads made with heirloom vegetables, local olive oil, and area boutique cheeses, notice the café’s entrance walls lined with the winery’s special reserve bottles and wine-permeated jams. And don’t forget to check out the European-style breads, baked in the open-hearth oven that is the centerpiece of the open kitchen run by Austrian chef Gunter Biederman. With an Israeli breakfast that boasts no less than 11 delicious spreads, next to shot glasses filled with yogurt and crunchy sweet muesli, French-style cheeses, and fresh drinks of your choice (anyone up for some fresh-squeezed carrot juice? ), Café Naadi in downtown Jerusalem is a great place to pass the time, indulge in a giant breakfast, or just grab a great flaky butter croissant. When you want something really great, sometimes you have to go right to the source. 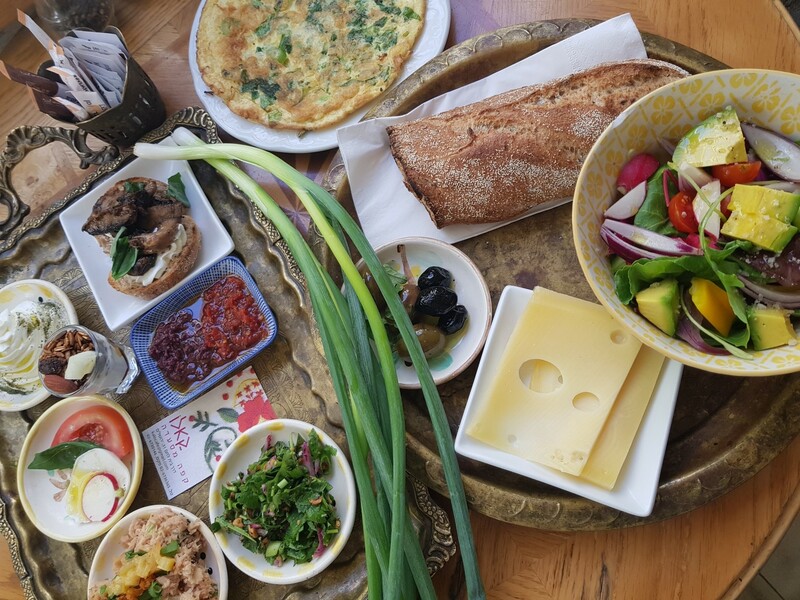 Since cheese is an essential part of the Israeli breakfast experience, one can only assume that eating Israeli breakfast at a boutique dairy is one way to take the meal up a few notches. Take your breakfast here, and you’ll get fresh and aged goat cheeses and goat’s milk butter to go with your house-made jam, country bread, roasted red peppers and Galilean olives. This café begs to be taken at face value (its claim to fame is being “concept-less”), and the proof is in the pudding, er, Israeli breakfast. Splayed out in boho-chic fashion on top of brown parchment paper, mounds of delicious salads and creamy nests of labaneh and cream cheese meet piles of eggs and salads dressed up with toasted almonds, seeds and charred veggies. A smorgasbord of vegetarian yum of which the family patriarch, Grandpa Bucke (namesake for this hipster haven) would be proud. Churning out stunning French-style pastries is just one of this famous Jerusalem bakery’s super powers. The other is the hold they have on Jerusalemites, commanding a never-ending line of Friday brunchers hoping to get a table to enjoy the delicious breakfast on offer. Open since 1967, the cozy café has had ample time to perfect the ceremonious meal, which includes its famous brioche (for as long as it lasts each day), mushrooms in pesto sauce, and eggplant with labane. As with the other bakeries on this list that specialize in pastry, we recommend getting a croissant on the side while you’re at it. You won’t regret or soon forget the experience. Benedict is one place in Israel where you can unabashedly revel in a side of bacon if you are so inclined. With its main branch across from Herzliya’s beautiful waterfront, and others in the foodie complex of Sarona Market in Tel Aviv, on Tel Aviv’s Ben Yehuda Street and in other central locations, this breakfast mecca combines the attractive elements of a European bistro with American diner culture. In true Tel Aviv fashion, Benedict’s Israeli breakfast comes with a mimosa and unlimited bread straight from the café’s bakery. Get your meal with a Balkan twist of creamed spinach, herbs, cherry tomatoes and Bulgarian cheese, or as a surprise treat, Spanish-style, with onions, potatoes, bell peppers and even sour cream. Benedict is open 24 hours a day, so you can enjoy your breakfast after crawling out of the Tel Aviv club late at night, or in the quiet late afternoon hours (when you finally get out of bed the next day), as you please. Also in Jerusalem’s downtown triangle, Kalo Café is possibly the homiest of all the foodie gathering spots on this list, providing the inimitable warmth of a country kitchen provides, while also making for a great people-watching spot. Mini caprese salads, cured salmon topped with radishes, and a ruffled piped dish of labaneh, olive oil and the café’s own dried zaatar mix, are just a few of the little delicacies you can partake in alongside your eggs, bread and spreads. With built-in hashtags already listed throughout the menu, all you have to do at Lola is eat, enjoy and maybe snap a quick Instagrammable pic of your beautiful Israeli breakfast. Carrying the fun, easy and young vibe of the city, and even serving as a performance space in the evenings, this student-town café is also one of the top places in Beersheva’s Old City area to brunch it up over fresh-squeezed juice, a good latte, and a regular or vegan Israeli breakfast complete with zaatar-dusted pita bread, aioli of red peppers, and of course, cubes of feta-like Bulgarian cheese. Now found in eight different locations throughout Israel, Café Louise originates in Haifa, where the flagship café still serves packed tables of loyal locals. Known for its vegan and vegetarian offerings, but also for pleasing anyone with a good appetite and an affinity for the homemade breads, spreads, jams and sauces, and other baked goods that appear in the elaborate breakfast spread and the in-house store and bakery, Café Louise offers extras such as tapioca parfait and fresh healthy juices that push this Israeli breakfast over the edge into awesomeness. If breakfast with a view calls your name, then Seudat Gan Eden just might be the place for you to grab Israeli breakfast when in the Safed (Tzfat) area. High in the hills above the city, nothing beats the view of the surrounding mountainous and tall pines unique to the Upper Galilee. With attention to décor and a menu of homemade Italian-inspired café fare, the Brigel family — who own this divine café — make breakfast, or any meal here, a personal experience.